Matteo Ricci 利瑪竇, whose grave lies in the Ming-era Jesuit cemetery now within the precinct of the Beijing Municipal Cadre's School, is a figure who even four-hundred years after his death elicits hopeful commentaries and reflections on inter-cultural respect and understanding. Ricci and his fellow Jesuit missionaries travelled to the 'Far East' to convert and offer salvation to a broader humanity. It is a mission that the Catholic Church, and various other iterations of the Christian tradition, pursue in China to this day. This issue of China Heritage Quarterly takes Matteo Ricci as its focus and our guest editor, Dr Jeremy Clarke SJ, presents material on Ricci's life and significance, present-day commemorative activities related to his passing in 1610, as well as offering an insightful meditation on Xu Guangqi 徐光啓,a much-celebrated Chinese Christian convert, by Aloysius Jin Luxian 金魯賢. In Articles, Pierre Fuller comments on the Bible in China today, while in New Scholarship Bede Bidlack discusses the extraordinary figure Pierre Teilhard de Chardin, a Jesuit, geologist and theologian who was active in China from 1923 to 1946. In this issue we also offer further material related to Shanghai, the focus of our March 2010 issue. In Articles we feature a photographic essay related to the 2010 Expo by Lois Conner while Jonathan Hutt provides a nuanced analysis of Zhang Ruogu 張若谷, a man who thought that the city 'was the descendant of the great European capitals from antiquity to the present day, a progeny that could well bring the ideals of these ancient and alien civilizations to the Far East and into the modern age'. In T'ien Hsia, essays on Shanghai's 'mosquito press' and the 'foreign mentality' retrace other contours of the old Shanghai. Also in New Scholarship, Magnus Fiskesjö discusses a prominent Swedish archaeologist and Duncan Campbell offers a review of a new book on China's 'black tigers' (hei laohu 黑老虎), or stone rubbings. In this issue we also introduce the Australian Centre on China in the World 中华全球研究中心／中華全球研究中心, a research institution recently established at The Australian National University in Canberra. A future issue will focus on the new Centre. My thanks, as ever, to Daniel Sanderson for his assistance in editing, design and layout. The life and work of Matteo Ricci is well known. This sixteenth-century Jesuit and missionary first arrived in Macau in 1582 and then from the next year spent the following twenty-seven years living and working throughout China. The anniversaries of his entry to a particular town, or the publication of a certain text composed by Ricci or the translation of certain aspects of European thought and learning popularised by him have all provided opportunities for commemorative activities. Since 1982 — the four-hundredth year anniversary of Ricci’s arrival in East Asia (after having spent a number of years in Goa) — there have been gatherings, conferences, memorial publications and even philatelic displays. In 2010, 11 May marked the 400th year since his death in Beijing, and this too occasioned many celebrations and events around the world. As every anniversary is celebrated, scholars reflect once more on the legacy of Matteo Ricci. It is certainly true that for each new generation of scholars there may indeed be new insights to be gained from such reflections. Furthermore, younger scholars may not only bring both new methodology and new materials to the discussion but may also encounter older research for the first time. Even so, as remarked upon by Professor Nicolas Standaert SJ, professor of Sinology at Katholieke Universiteit Leuven (Belgium), it might be reasonable to ask 'can anything more be said about Ricci?’ Simply, has he become too well known, to the detriment of other historical personages and events? Fig. 1 The Society of Jesus (Yesu Hui 耶穌會), engraved in stone. The Features section of this issue of China Heritage Quarterly carries the work of three Jesuit scholars, each of whom seeks to broaden the parameters of this discussion. Although this material is available in other sources, this commemorative issue allows us to bring it together for a more diverse academic and general audience. Nicolas Standaert, in an article originally carried by Thinking Faith (the online journal of the British province of the Society of Jesus) and reproduced with permission here, summarises previous research on Ricci. He notes that some of older work on this seminal figure has stood the test of time remarkably well. He also goes on to suggest that rather than considering the ways in which Ricci 'changed China’ (if he did, indeed, at all), scholars should be considering the manner in which Ricci and his European Jesuit companions, as well as Europe itself, was actually changed by their encounter with China and Chinese culture. Availing myself of this opportunity I also reproduce an article for America, a weekly journal published by the Society of Jesus in the United States. In this piece, 'Matteo Ricci’s World', I highlight the necessary and essential contributions of the Chinese Christians and companions who assisted Ricci in his academic and religious endeavours. I argue that it is through the lens of friendship and relationship that one may best see the work of Ricci and his early Jesuit companions. Finally, we include here a lecture delivered by Antoni Üçerler SJ at Gonzaga College, Dublin, sponsored by the Irish Jesuits. Üçerler is a professor of Japanese history at Campion Hall, Oxford and a member of the Faculty of Oriental Studies, Oxford. In that lecture, he discusses the impact of Ricci, with reference to what was happening in other parts of East Asia in that era. While Jesuits are rightly proud of the contributions of Ricci and his companions, we are also aware that an excessive enthusiasm for one person might well conceal the contributions of others. In praising the deeds of one man, there is every danger that the achievements and acts of other men and women, both Chinese and European, are left off the pages of history. Commemorations that continue to emphasize this approach do little to augment the field of history but rather drape themselves in the cloak of hagiography. There are obvious limitations to this approach of course, but not the least of them is the unacceptable near-deification of one mere mortal. While it is true that Ricci and his companions were outstandingly able and gifted men — a 'generation of giants’ to use George Dunne’s phrase — they were only able to achieve what they did through the assistance given to them by their Chinese companions and because of the humanistic learning they enjoyed in their education in Jesuit-run colleges back in their native lands. It is the influence of these colleges and the teachers in them, as well as the contributions of the companions and friends the missionaries made during the course of their work in China, which is attracting the interest of new scholarship. To that end, in recent years there have been conferences about the role of the schools and various educators in Europe as well as conferences and papers about some of the Chinese scholars (or lesser known Jesuits) who have been overshadowed by Ricci’s lustre. 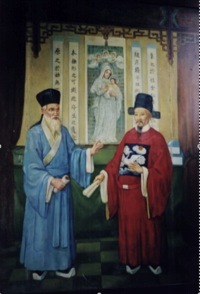 Thus, for instance, there have been considerations of the role of Alessandro Valignano (the architect of the Jesuit missions in East Asia and the Jesuit who assigned Ricci to work in China), as well as studies on the role of Xu Guangqi 徐光啟, Ricci’s friend and academic companion who helped in translations of both religious treatises and mathematical works (including the geometry of Euclid). A translation of a letter written by the Catholic bishop of Shanghai, Aloysius Jin Luxian 金魯賢, to his diocese is included in Articles. Jin is one who considers that for all of Ricci’s impressive activities, not enough has been made of the assistance he received from people like Xu Guangqi, a scholar from Shanghai. Jin uses the timing of the Ricci anniversaries to commemorate the work of Xu and advocates greater awareness of his many contributions. Each new round of anniversaries has led the various cities, universities and communities that have ties with the Ricci legacy to use this relationship in several ways. First, the anniversaries are seen as a golden opportunity to remind others of the enduring and important privileged position the town or university has with China as a result of its connection to the Ricci story. Thus, as the birthplace of Ricci, for instance, the Italian city of Macerata can pride itself over Rome, (although the fact that Ricci studied at the famous Roman College can be an annoying distraction). Likewise at anniversary time, the cities of Macau, Zhaoqing 肇慶, Nanjing and Beijing, among others, also try to make the most of their role in Ricci’s life story. It is for this reason that political, religious and diplomatic figures seek to sponsor or even address these gatherings, dwelling on the significant and ongoing role their own city or institution has in the ever-important China relationship. Secondly, institutions that continue to strive to develop relationships with China — as well as Chinese institutions that seek to develop relationships with academic and other bodies outside China — conveniently manage to illustrate the ways in which the work of Ricci and his Chinese and European confreres is carried on by their own organisations. Thus, for instance, the Italian government has stated that the newly emphasized trade corridor between Genoa and Tianjin is to be named after Matteo Ricci and Fudan University 復旦大學 in Shanghai has announced the establishment of a new academic institute named after Ricci’s academic companion, Xu Guangqi. This issue of China Heritage Quarterly notes a number of such activities that have occurred throughout the time of the Ricci anniversaries as a way of illustrating not only the continued interest in Ricci and his legacy but also the ways in which his work is harnessed for each institution’s own ends. One of the ongoing challenges facing those engaged in cross-cultural and inter-religious dialogue is the need to be able to understand what the other is saying before one can evaluate whether or not one agrees with it in the light of one’s own tradition. This is a perennial concern, which affected the work of Ricci as it continues to affect scholars today. As one way of considering these questions we also publish here in New Scholarship a reflection on the ways in which one other Jesuit scholar — Teilhard de Chardin — tried to engage with Daoism. Fortuitously, in recalling the March 2010 issue of China Heritage Quarterly, Teilhard also lived for many years in Tianjin. Finally, the ongoing popularity of Ricci’s story and the manner in which its legacy can be utilised by other groups means that Ricci as a figure and an influence will continue to be of considerable importance. Here are two challenges I would suggest for those engaged in scholarship about this period and these relationships. Just as Valignano was greatly influenced by what he experienced in Japan, which both culminated in his work Mission Principles for Japan and affected the guidelines he gave to Ruggieri and Ricci, so too was Ricci influenced by his time as a young missionary elsewhere. Not a great deal of research has been conducted on Ricci’s time in India, where he lived between September 1578 and April 1582 before setting out for Macau, having been called there by his religious superior, Valignano. There was also at least one Indian servant living with the Jesuits in the mission residence Zhaoqing, during their early years. There was also great exchange between the Jesuit residences in Goa and Macau during these years, both in terms of manpower, money and materials. It does seem that the effect of these years in India and the relationships Ricci enjoyed during that time has been little studied and could bring to light some interesting details about Ricci’s disposition. Clearly the lessons he learnt in India had some bearing on his future work in China. There has yet to be a comprehensive monograph on the young Chinese men — some of who were of mixed parentage — who assisted Ruggieri and Ricci during the foundational years. While, for instance, there is much than can be uncovered about the lives of people like Zhong Mingren 鐘鸣仁 and Huang Mingsha 黃明沙 (both of whom became Jesuit brothers, and were in fact the first Chinese Jesuits), this has yet to be done in any systematic or, to my mind, satisfactory way. These men, and other Chinese Christians of the early years of the Chinese church, deserve to be better known. Hopefully, by the time of the next significant anniversaries, this situation will have improved. There are always anniversaries, of course: for instance, 2011 is the 350th anniversary of the building of the Church of the Saviour in Hangzhou 杭州, and 2016 is the 350th anniversary of the famous Jesuit astronomer Adam Schall von Bell 湯若望. The list could indeed go on!